Celebrate your next birthday in style! You and your party guests can swim in our full size indoor heated pool then enjoy time in our party room. Pricing includes one hour in our spacious indoor heated pool and one hour in our private party room. Lifeguards will staff the pool at all times. Pricing includes one hour swimming with the Mermaid, one hour in the party room, the JCC Mermaid will also pose for photos for 15 minutes after the swim session. 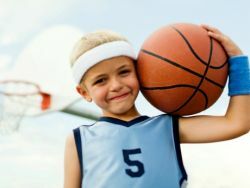 You and your party guests can play basketball, volleyball, kickball, soccer, wiffle ball or whatever you would like in our full size equipped gymnasium.Then enjoy time in our party room. Borrow our gym equipment or bring your own. Pricing includes one hour in our spacious gymnasium and one hour in our private party room.